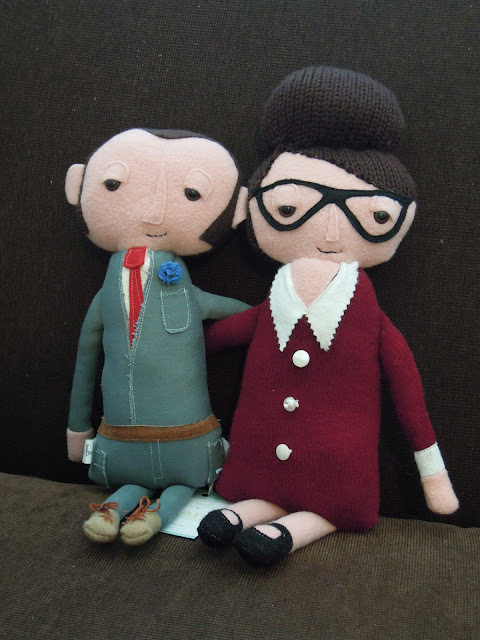 This year was my parents 50th Wedding Anniversary and I decided to ask Erin of Boolah Baguette to make custom dolls. The process was pretty easy, all I had to do on my end was find a photo of my parents when they were first dating and Erin took care of the rest. When Erin emailed us to say that the dolls were ready for pick up we were truly excited! What is so incredible about Erin's work is the attention to the details. With just a couple of photos emailed off and a bit of time Erin came up with the likeness of my parents when they were first dating to a tee. The details that we love are the scalloped collar, the sparkling button on the dress and the cat glasses that my mom wore. As well as the other details that we just can't say enough about which is the red tie and the sideburns that my dad fashionably sported. Her work is truly amazing and it is one of the reasons why we buy local and handmade. Thanks Erin!! !